The de Young Grouping derives from the flags deaccessed in the 1990s from the holdings of the M.H. de Young Museum in Golden Gate Park in San Francisco, CA . When the museum formed from de Young’s personal collections was created it was the first true museum in San Francisco. It was an immediate success from its inception and has remained an integral component of the cultural life of San Francisco for over a century. Michael Henry de Young,1849 -1925, was an American journalist and businessman who owned and published the San Francisco Chronicle. He used his wealth to further his eclectic tastes and accumulated a collection of immense variety, and such diverse objects such as sculptures, paintings, flags, polished tree slabs, paintings, objet d-art, jewelry, a door reputedly from Newgate Prison, bird eggs, handcuffs and thumbscrews, and a collection of knives and forks. As an international collector he was a rival of William Randolph Hearst who both sought to amass impressive collections of exotica for both public and private display. 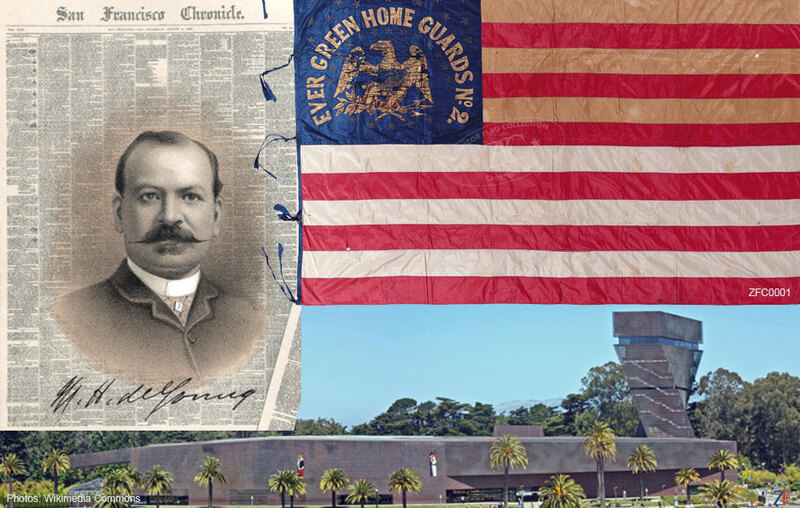 As the premier repository in San Francisco, the de Young Museum came to house a number of important flags associated with early California history; the Palio Contradas, France, Europe, the American acquisition of the Philippines, and WWI.